Every day six young people aged 16-24 are told they have cancer. Most of them will either be treated in childrens wards or adult wards, away from contact with their peer group. Incidence rates of cancer are now higher in 13-24 year olds than in children, yet survival rates for this age group have not improved as much. The Teenage Cancer Trust provides specialist units within NHS hospitals for young people with cancer, to improve their quality of life and chances of survival, by providing appropriate, tailor made facilities and pooling expertise and knowledge. The Teenage Cancer Trust has been selected as this year’s main beneficiary of the May Day Fair, which will take place on 6th May 2013 from 11am – 4pm. The charity was founded almost by chance by a group of women who were fundraising for a children’s intensive care unit at Guy’s Hospital. The group met a mother whose son developed cancer at the age of 13. They heard how he was treated at times in a childrens ward, alongside babies, or in an adult ward alongside older people – making the (already unimaginably stressful experience) – even worse. The fundraisers met the consultant treating the young man who explained that not only did young people have to face the trauma of cancer, its treatment and isolation from their peers at a sensitive stage in life, but that they also tended to get rare cancers. The fundraisers went on to create the first Teenage Cancer Trust unit at the Middlesex Hospital in 1990. The Trust has gone on to fund, build and maintain 25 units across the UK, all free to access, in NHS hospitals. The Teenage Cancer Trust don’t believe that teenagers should have to stop being teenagers, just because they have cancer. The centres are specially designed, incorporating suggestions and ideas from young people themselves. 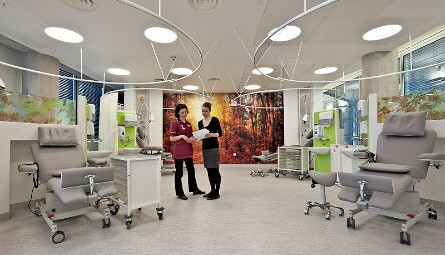 The centre at University College Hospital in London (pictured) opened in April 2012 and caters for patients aged between 13 and 24. 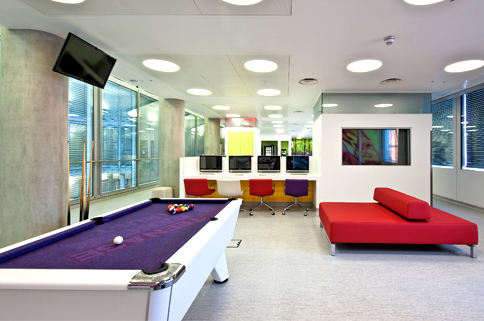 There are six individual day care pods for the treatment of chemotherapy, together with a ‘Hub’, DJ booth, pool and football table, with a variety of settings for young people to communicate with each other and share their experiences of cancer. Alongside all of this is an NHS medical team of teenage cancer specialists, who pool knowledge to create a pool of expertise that’s second to none. The Teenage Cancer Trust relies solely on donations to fund its work. It aims to open ten more centres in the UK within NHS hospitals at Principal Treatment Centres for cancer, to ensure that all young people needing hospital treatment for cancer have access to the dedicated, specialist support they provide, no matter where they live. Diagnosis is often a long process, with health professionals confusing symptoms with growing pains. 61% of young people with cancer surveyed by the TCT felt that their diagnosis could have been made more quickly. 21% of patients reported that their GP did not refer them to a specialist at all, despite 59% presenting at least two of the most common cancer symptons; pain, lump/swelling, tiredness, headache or drastic weight loss. In addition to financing, building and maintaining specialist centre, the TCT runs an extensive education programme, targeting both health professionals and young people and funds the country’s first Professor of Teenage Cancer Medicine who leads research into why young people get cancer and how best to treat it. You can find out more and read the stories of young people who have benefitted from the work of the Teenage Cancer Trust on their website www.teenagecancertrust.org We are hoping that some young people will be attending the fair on May Day to speak to visitors about the work of the Trust and how it has helped them. Each year, with your help, we are able to raise over £6,000 for charities. The main beneficiary receives the largest share of the surplus, with other local groups, including Christ Church Southgate (which is now also a charity) receiving smaller amounts. Offers of help on the day are particularly welcome, as are donation of plants, books, toys and cakes. To find out more, please speak to Frances Wyatt (07961 408055), Nicole Cross (0208 847 1201 or 07850 391285). ← Introducing Richard Brain – Our new Director of Music!